Informal learning is the primary source of knowledge for every single one of us. To clarify, for most people, approximately two-thirds of our lifetime is spent learning informally, or outside formal education environments. As you can see from this graphic provided by the U.S. Department of Education, the percentage of our waking hours spent learning in formal educational environments increases at the onset of elementary school, but then decreases dramatically following high school graduation. 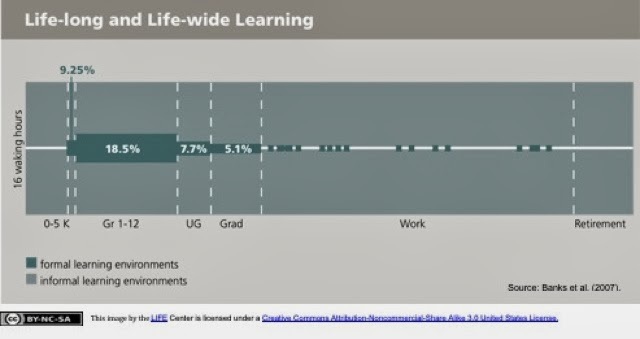 Learning supported through Internet connections and social networks is impacting the time spent in formal learning environments as more people choose opportunities other than college to continue their education. Knowing this information, educators that want to make a life-long impact on their students' learning should consider embracing the characteristics that feed informal learning. This can be accomplished by emphasizing a growth mindset, a love of learning, and an entrepreneurial spirit supported by web-connected technologies. Formal education is a single chapter in the book of life-long learning. Informal learning is self-determined. The study of self-determined learning is called heutagogy. Heutagogical theory and practices will gain attention as more people come to recognize the economic and social requisites of re-education and current competencies. As you can see, it is important for educators to recognize and embrace the characteristics that make informal learning personally meaningful and relevant. According to research publicized by Daniel Pink in his book, Drive, people achieve higher performance and greater personal satisfaction when three factors are prevalent; autonomy, mastery, and purpose. Since these factors are closely related to intrinsic motivation, it becomes evident why informal learning has so much potential for personal meaning and endurance. It should be noted that extrinsic rewards commonly found in formal learning environments, such as grades or points, have been shown to decrease performance on tasks requiring cognition and creativity. How can educators foster a love of learning using autonomy, mastery, and purpose? Companies like 3M and Google popularized the concept of 20% time. Also called "Genius Hour" in educational circles, 20% time is a block of time dedicated to personal exploration and knowledge acquisition based solely on the the learner's interests and passions. Educators such as A. J. Juliani have shared research showing the deeper learning value of permitting student choice. Angela Maiers, author of "The Passon-Driven Classroom", is a champion of passion-based learning. Angela's primary message is each student matters. This message gets reinforced when students learning grows from initiating authentic, passion-based, projects intended to reach, or serve authentic audiences. As with the previous examples, student choice and meaningful work help to drive impressive results that pay the learning experience forward to others. Mindset is life-long learning approach popularized by the research of Carol Dweck. People with a fixed mindset believe success or failure depends on innate personal qualities and circumstances. Motivation increases when learners adopt a growth mindset, meaning that success is the result of effort, resilience, and a love of learning. In a growth mindset, failures are viewed as temporary setbacks that offer insights to greater learning and growth. Life-wide Learning emphasizes the authentic activities, settings, and experiences of the whole-learner. Based on the research of John Dewey, life-wide learning accounts for the experiential learning that occurs in real contexts. Guitar lessons, football practice, and family vacations can all contribute to the informal learning package. Once again, learner choice, authentic situations, and desire for increased mastery contribute to the motivation and satisfaction of the learner. Many connected educators have come to the realization that they are no longer sole purveyors of knowledge and information. Most of us will spend a majority of our adult lives learning in informal environments. I believe that it is essential for educators to create opportunities for students to develop their passions and skills that will help to maximize their informal learning experiences. Building life-long impact is about learning and relationships. Kevin Honeycutt's tweet from last week says it best... "Learn2Love2Learn"
Should teachers change their pedagogy to support informal learning? If so, how? What classroom strategies would you recommend to support students' informal learning? This is a GREAT post. I'm really digging the notion that given how little time that we spend with kids in schools, our greatest impact is had when we teach them to own their own learning. Those skills are the greatest skills that we could possibly pass on to them. Thanks for reading, commenting, and sharing. This post came to mind after reading your "rant" about the need to provide meaningful, personal, learning experiences. I fully agree with your comment. I believe postal workers, print journalists, bankers, travel consultants, and physicians would also agree seeing how these professions have changed dramatically with the advancement of technology. Being able to re-educate ourselves is becoming a matter of relevance and economic survival. I thoroughly enjoy reading your posts - keep 'em coming!